We were very excited last month to announce our integration with the CareCloud Practice Management System. CareCloud believes that “healthcare deserves tools that are as modern, well-designed, and easy-to-use as the ones encountered elsewhere in our daily lives.” We couldn’t have said that better ourselves. Here are five reasons that CareCloud customers are turning to Chiron as their telemedicine solution. The Chiron-CareCloud partnership is a match made – well – in the cloud. We both offer services that are entirely internet-based. You don’t have to download or install any software, and you can be sure that you are always on the latest version. Maintenance is on us, not on you. If you are a CareCloud customer, you are already using it to schedule your in-person visits. With Chiron Health, you can use it to schedule video visits as well. ‘Chiron Telemedicine’ simply becomes another appointment type. Once it is selected, all of the necessary information is automatically sent to the Chiron application, you don’t have to schedule the appointment in two different systems. When you schedule a video visit, your patient’s insurance information will populate Chiron Health automatically. There’s no need for the duplicate entry required by solutions that are not seamless. While a great deal of progress is being made, laws and payer policies related to video visits remain complex. Chiron Health has dedicated our resources to insurance eligibility verification so you don’t have to. The Chiron Rules Engine will check the eligibility of every patient to ensure that you’ll be reimbursed. Patient privacy and security are primary concerns for your team as well as ours. That’s why our solution is designed to meet HIPAA’s strict requirements. We also know that it is important our solution be easy to use for your staff and patients. With the CareCloud/Chiron Health integration, all documentation is completed in your current EHR, which means no new clinical systems to learn. 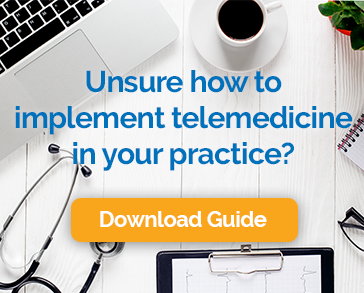 Practices across the country are realizing that telemedicine offers great convenience for patients and new revenue opportunities for providers. The combination of the CareCloud and Chiron Health solutions gives users a flexible, modern platform to support this increasingly popular method of care. Check out this quick video to see exactly how easy offering video visits can be.